From SAW franchise expert Darren Lynn Bousman, atone for your sins in a transgressive mix of HOUSE OF WHIPCORD and THE MAGDALENE SISTERS. 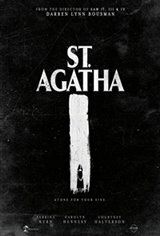 A pregnant con woman is on the run and seeks refuge in a small-town Georgia convent. But what first starts out as the perfect place to have a love child turns into a dark nightmare where fear eats the soul. For the sadistic Mother Superior enforces silence and ghastly secrets are masked by pious lies before the reluctant novitiate learns the sick and twisted truth behind the strange people that lurk inside its hallowed halls.